MEXICO – High School STRIVE and A+ programs at the Center for Instruction, Technology and Innovation recently banded together to create and donate items to children in foster care. CiTi students create and donate items to children in foster care. From left, students Kyle Homer, Chris Arnold, Patti Pennock from DSS Foster Care, James Gorton and Emmanuel Perry. 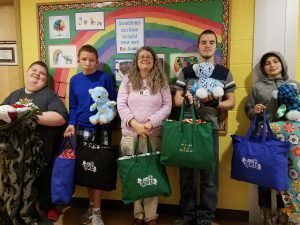 The students made cut-and-tie blankets in class as well as stuffed teddy bears with donated material. Collaborating with the Project Explore Retail CiTi class, these items were placed in a bag with the CiTi Sparks mascot logo and an inspirational quote selected by the students imprinted on the side. The gift bags were picked up by a representative from the Department of Social Services Foster Care system and will be distributed to children in foster care.